Now it seems either breathtakingly arrogant or plain mad, but in 1979 global diplomacy had no public voice for, nor knowledge of, Muslim fundamentalism. When President Jimmy Carter, as Commander-in-Chief, sent in his newly formed Delta Force to rescue 53 American hostages seized with the US Embassy in Tehran, he was behaving as the heads of superpowers had behaved since Roman times. An embassy has always physically represented the ‘national soil’ of a country. An invasion of it is an act of war. Carter’s may have been a knee-jerk reaction, but it seemed reasonable: Britain felt the same way when Argentina invaded the Falkland Islands. The difference was the circumstances that forced Carter to hedge his entire bet. The Shah of Iran – a long time ‘client’ of NATO – had only recently been forced out, and might conceivably return to nominal or real power. The antagonism between Iran’s new, civilian politicians and its religious leaders under Ayatollah Khomeini was neither understood nor resolved. Eagle Claw had to look like a ‘punishment’ raid, not war. Nobody must be offended. Eagle Claw was inspired by the Israeli success at Entebbe in 1976, but it was much more complicated. Several huge C-130 transports had to land ‘in the Iranian desert’, wait while nine helicopters deposited Delta Force ‘specialists’ in Tehran itself, and after roughly 24 hours to cover the ‘extraction’, pick up the hostage group from Tehran airport (secured, improbably, from any opposition!) and fly them somewhere with decent hamburgers. 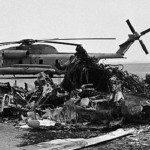 A sandstorm reduced the airworthy helicopters to five and exhausted the pilots beyond the endurable. Eagle Claw was aborted – leaving eight dead in a desert fireball after a C-130 transport collided with a helicopter, the hostages in captivity, the global influence of Iran’s student fundamentalist group massively enhanced, and Carter’s presidency in ashes. The hostages were released to mark incoming President Reagan’s inauguration. Death toll: Eight US servicemen died and America suffered a disastrous humiliation, enabling Khomeini to consolidate his grip on power. From being an embarrassment to the new regime, unskilled at the propaganda game, the 52 remaining hostages became a major bargaining chip. Eagle Claw cost Carter a second term, and shocked America’s allies (who had been neither informed nor consulted about it) into forming premature policies preferring sanctions to any show of force. The mission’s failure created the political suspicion that led, eventually but unerringly, to George W Bush’s 2002 inclusion of Iran in his ‘Axis of Evil’.